South on Gulf Blvd. over the Sand Key Bridge to the Belleair Beach Causeway. On the causeway, go 5 miles straight east through downtown Largo to the Country Club Drive traffic light. Turn right into entrance. Head north on Gulf Blvd. to the Belleair Beach Causeway. On the causeway, go 5 miles straight east through downtown Largo to the Country Club Drive traffic light. Turn right into entrance. Come inland on the Treasure Island Bridge on to Central Ave. and make a left to the north at the Park Street traffic light. Stay on this road north 12 miles (Park turns into Starkey about halfway) to East Bay Drive. Turn left to the west and turn left at the next traffic light, Country Club Drive. Proceed to the course. 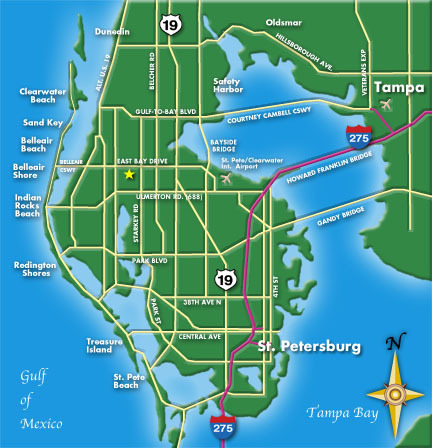 Take I-275 north to Exit 30 (old exit16) and follow signs to the St. Pete/Clearwater Airport. Pass the airport 5 miles west on 686 (East Bay Drive) to the Country Club Drive traffic light. Turn left into entrance. Take 1-275 south across the bay on the Howard Frankland Bridge and take the second exit to Largo and the Gulf Beaches (688 west). Continue heading west 2 miles and follow signs to 686 west and the St. Pete/Clearwater Airport. Pass the airport and continue 5 miles west to the Country Club Drive traffic light. Turn left into entrance.